Telltale Games won't rest until its phenomenal adventure game adaptation of The Walking Dead is available on every platform, and next on deck is Sony's Vita handheld. In a recent IGN interview with Don Mesa, the "Director of Product Planning and Platform Software Innovation" for Sony's PlayStation wing, Mesa reveals that Telltale Games' The Walking Dead is currently in development for the PlayStation Vita handheld. This should come as little surprise, given that the game is currently available on the Xbox Live Arcade, PlayStation Network, Steam and iOS platforms, but it's still undeniably positive news for owners of Sony's spectacularly designed, yet poorly supported gaming machine. As for what fans can expect from this particular incarnation of The Walking Dead, Mesa believes the Vita's unique capabilities - or, at the very least, it's portability - will add arguably new gameplay dimensions to the largely simplistic adventure game. "We think that the emotion and the immersive experiences you're going to get there, wherever you're sitting, if you're in your living room and playing on your Vita or sitting at a cafÃ© or at the bus stop and playing this, you get that shock or fright," Mesa states. "I think that's going to be important. That's what we want to deliver as you're playing." Those of you who own The Walking Dead on, say, the iPad will no doubt have raised an eyebrow at Mesa's claims. Apple's ubiquitous tablet is at least as portable as the Vita (in its Mini incarnation, if not its full-sized brethren), so we're wondering exactly what new elements the Vita game might bring to the table. Then again, it's hard to care much. 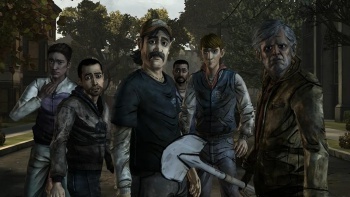 The Walking Dead was widely seen as the best game released during 2012, despite strong competition from any number of high-budget, more mainstream games. Whether or not the Vita version adds new gameplay options is beside the point: More Walking Dead is cool by us, no matter what shape it takes. There's currently no release window for the Vita incarnation of The Walking Dead, but we'll be sure to bring you that news just as soon as Sony or Telltale Games nails down a specific timeframe.